This Persian rug invites the viewer to relaxation and meditation. It also inspires purity for both the mind and soul. 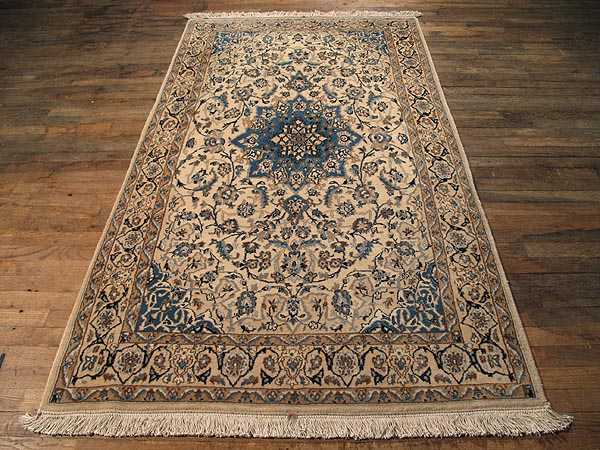 As all Nain style Persian rugs this also has the Nain style characteristic quality design features. The ivory background is used both for the field and the borders creating a smooth continuity between the two elements. The blue used for decorating is complementary with the ivory background. The rosette medallion in the center combines warm and cold colors to create balance and a greater aesthetic effect. The rugs produced in the region of Nain are also very popular. They feature a specific design with an ivory or blue background. The central medallion colors matches the background but also the motifs used inside the rug. Older rugs from this region are very difficult to find but the quality is exceptional, as has always been in this region.